It took them some time to gain traction with customers, but hybrid and electric vehicle models have been quickly growing in popularity in recent years. 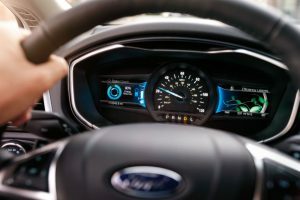 A lot of that has to do with the hybrid and electric vehicle offerings from Ford – a lineup which includes the 2019 Ford Fusion Hybrid and the 2019 Ford Fusion Energi. Unlike other hybrid and electric vehicle models out there, the 2019 Fusion Hybrid and the 2019 Fusion Energi take the money-saving gas mileage you’d expect from a hybrid or electric vehicle and combine it with the power you need for everyday life. To see what we mean, let’s check out the power and gas mileage ratings for the 2019 Ford Fusion Hybrid and Energi. How Powerful and Fuel Efficient is the 2019 Ford Fusion Hybrid at Brandon Ford in Tampa FL? The hybrid powertrain of the new Ford Fusion Hybrid at Brandon Ford in Tampa, FL, is the perfect example of how far hybrid powertrains have come over the last few model years. That’s because the 2019 Ford Fusion Hybrid is powered by a 2.0-liter iVCT Atkinson-cycle inline 4-cylinder HEV engine, a permanent magnet AC-synchronous electric motor, and a lithium-ion battery. The engine itself features 141 horsepower and 129 pound-feet of torque, while the combine horsepower rating for the entire hybrid system clocks in a 188 horsepower. The 2019 Fusion Hybrid can get up to 44 city MPG and 41 highway MPG. How Powerful and Fuel Efficient is the 2019 Ford Fusion Energi at Brandon Ford in Tampa FL? That brings us to the 2019 Ford Fusion Energi, which is powered by the same setup, but with a boost to gas mileage. The 2019 Fusion Energi features gas mileage ratings of 43 city MPG and 41 highway MPG, to go along with hybrid ratings of 104 city MPGe and 91 highway MPGe. For more on the 2019 Ford Fusion Hybrid and Energi or any of our other new Ford models, please contact our staff here at Brandon Ford in Tampa, FL. What Engine Options are Available for the All-New Ford Fusion Lineup at Brandon Ford in Tampa FL? This entry was posted on Friday, December 21st, 2018 at 8:00 am	and is filed under Ford Fusion, Powertrain. You can follow any responses to this entry through the RSS 2.0 feed. Both comments and pings are currently closed.